I'm getting bored of the steering in my Spider being so heavy. There's no obvious cause (top mounts aren't seized and the rack is OK) but it's much heavier than other non-PAS cars including another near identical Spider. I have got 185/65 Tyres on but what's odd to me is that it doesn't get much lighter with speed, if you need a lot of lock quickly it's a bit of a pain. I want to try some 175s to see how they compare - I have one but need another - and then I'm going to use some MOT turning pads to measure the resistance of the system loaded but without tyre friction as I wonder if the top mounts are binding under load even if they're free when lightly loaded. Any ideas? I really don't want to change the bulkhead to fit the PAS rack. It wouldn't surprise me if the bearings in the top mount are failing, beta steering is heavy when parking but should be fine on the move. Lower Swivels or track rod ends dry? That's the reason I fitted power steering many years ago. At 82 I wouldn't be able to use it now without P.A.S. Have you checked the steering rack damper, I remember a post some time ago where removing it as a test resulted in much easier steering because it was faulty. I removed the rack damper a few weeks ago - it made no difference whatsoever so I've left if off! Good shout though. Neither the bottom swivels or track rod ends are seized or tight when the suspension is unloaded. It's possible the bottom swivels might be when the weight's on the wheels. Not much load goes though them but I'll definitely check when I've made my turn plates. But surely the steering damper should make a difference, if working ok it ought to help so the fact that you can't tell if it's on or off is suspicious. I agree it should - otherwise why is it there? The damper didn't seem worn out either. I thought I might get more steering vibration or kickback but I really couldn't tell and the steering was no lighter. I suppose I should suspect the rack too but again it seems very free with the wheels up in the air. I have a spare if I want to swap out and check it. You say the rack is Ok but on my last Coupe (see '1300 Coupes' thread) it turned out that the bearing where the steering column attaches was slowly disintegrating. A stealthy fault because nothing is visible. As Alan says, even with wide tyres, the steering should be spot on above 30mph. So I noticed with the wheels on home made turning pads (5mm steel plate with grease between) that there's some torsional load going into the NS top rubber mount. Not sure how, but it clearly shouldn't be happening so I took off the strut and stripped it down. 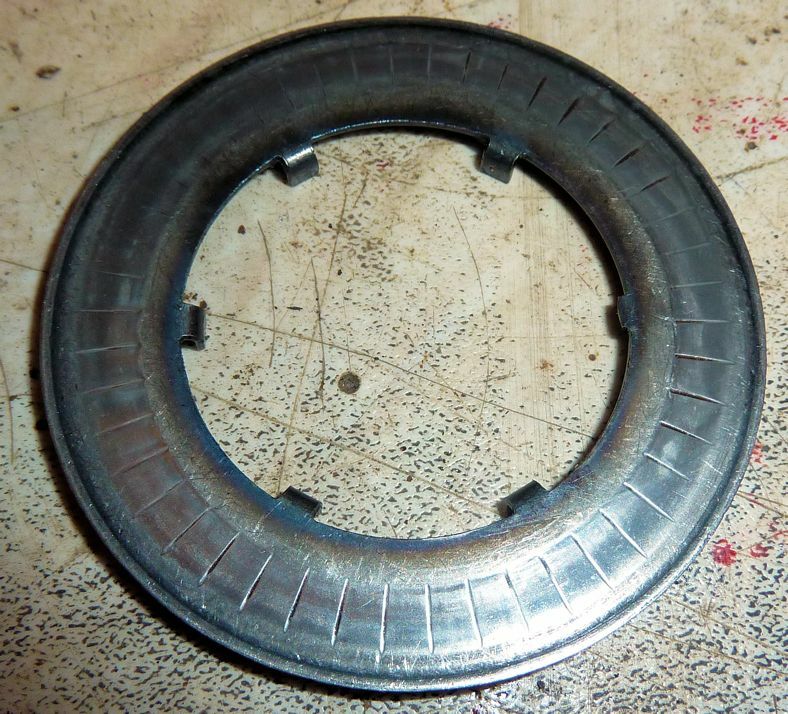 I found what I think is yet another top bearing design - which I'll replace and hopefully will help the steering. I also found though that there are two different spring top pans! One for Coupe / Spider the other for Berlina. The only difference is one holds the bump stop rubber 5mm lower. 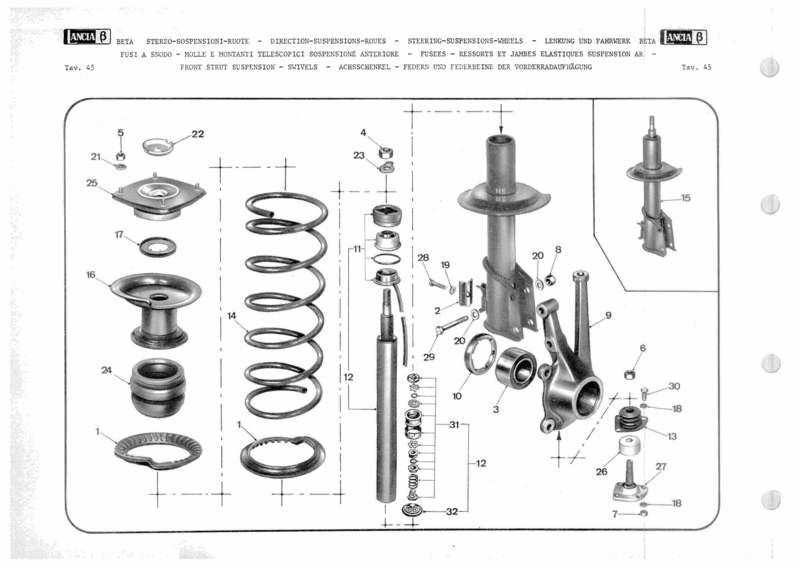 I'm guessing to account for slightly shorter springs on the Coupe & Spider. I dug through my spares and found five(!) three long and two short. Sadly the short ones were rusty enough to need acid sipping and careful checking before use so I'll fit the 'wrong' one for now while I wait for the two NOS ones I found in Italy to arrive. Most amazing of all it they were only £20 each - a bargain by Italian Lancia standards. Glad that you've hopefully found the problem Stuart. Strut top bearings seem to be becoming quite an issue. Just to confirm, is it the strut top bearing itself or the strut top with the rubber insert you have an issue with and have sourced? I found a spare bearing but the bits I've sourced are the metal spring seats. 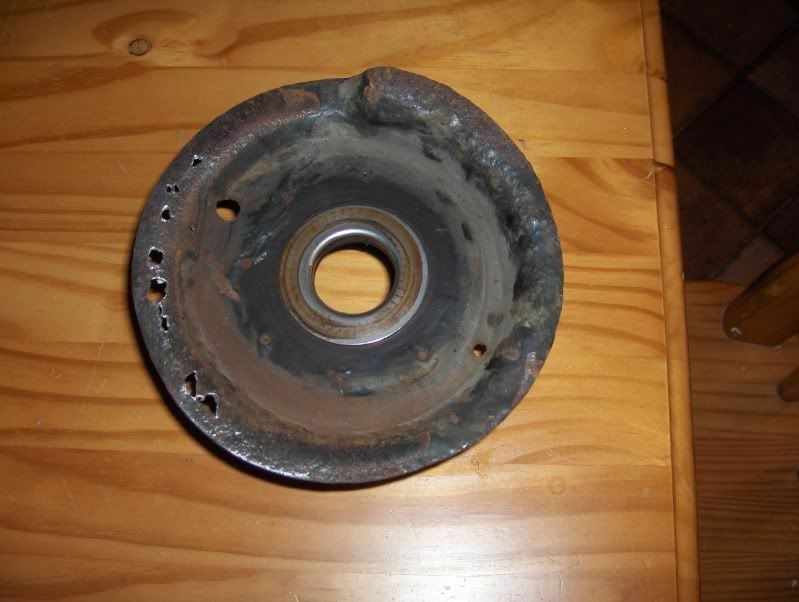 They look at bit like this but with more metal and less holes! But that is a rear spring seat (if I am not mistaken? ), the front has the rubber insert? 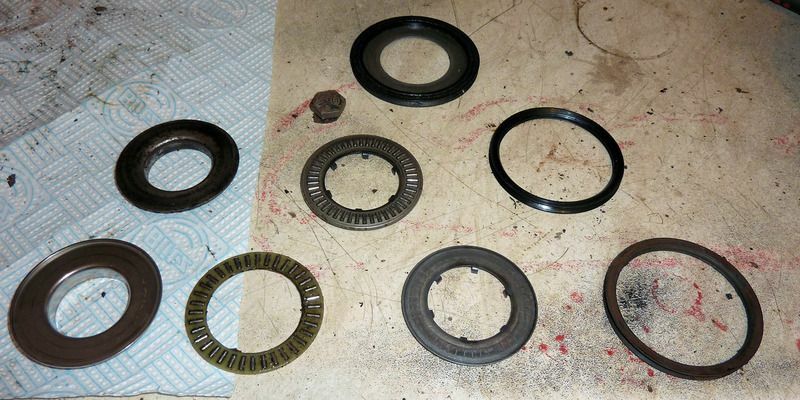 Were the bearings and seals in good condition? Not bad as it happens but they did feel a bit 'gritty'. The surface the lip seal bears on didn't give it much chance to seal though. That would seem to have sorted it. The steering isn't exactly light but it's certainly lighter roundabouts no longer require so much heaving! That's the upper bearing surface for the thrust bearing. Those lines aren't just lines they're dent's made by the rollers. I'd suggest that when not under load the bearing moved OK but when loaded the rollers picked up on the dent's and the bottom bearing surface then just slid on the locked rollers. The top one is an oddity - it's a bearing surface with a bonded seal - I couldn't find any other parts to match with it. In answer to your unfinished list. The top of the three has a roller bearing like the bottom one and a lower thrust plate like the middle one. That was the design which was on my early Spyder. I managed to extract the seal from the thrust plate and it could be used with the other two versions at a push. Now all we need is a definitive source of one type with the correct seal and all will be well. I may try to buy one of the Delta ones which look to fit ok.